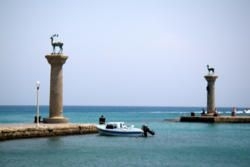 The breeze, brilliance of Rhodes wins the visitor who steps their foot on the bustling port, for one reason only: because its history is visible, present, glittering like a gem in the gold ring of the natural surrounding. 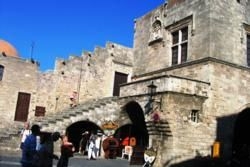 The city of Rhodes is regarded - for a reason, as one of the most beautiful cities in the world. 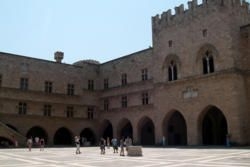 Cosmopolitan, with its own Italian rhythm, the medieval city of Rhodes welcomes the visitor with all its treasures beautifully preserved throughout the centuries. 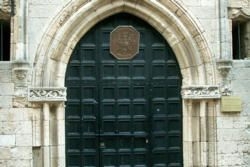 You may wander around its magnificent Old City for hours (or even days), surrounded by medieval walls and seven beautiful (original) gates, lost in a flash back in time. At every step you think you'll hear the heavy armour of the knights, following you through the narrow alleys. From every corner secret stories will raise filling up the imagination with images from the past. Passing through the Gate of Freedom, you have just entered one of the largest medieval towns in Europe, a mosaic of different cultures and civilizations. 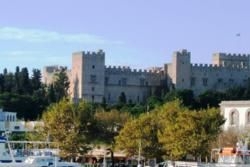 The castle’s fascinating fortress-like buildings, the bastions, walls, gates, narrow alleys, minarets, old houses, fountains, tranquil and busy squares make it feel like you have stepped back in time. 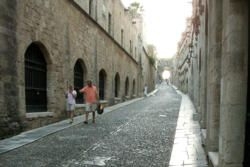 You become one of the lucky visitors having the chance to explore twenty-four centuries of history, walking the famous cobblestoned Street of the Knights. Admire the Palace of the Grand Master, the most awe-inspiring building in the whole island and certainly the highlight of the Old Town. Now it has been turned into a museum. Take a romantic stroll around and feel like turning to one of them, or a noble princess. The famous street, one of the best preserved in Europe, is packed with medieval inns that used to play host to the soldiers of the Order of the Knights. At the end you will get to the Museum Square, where stands the Hospital of the Knights, nowadays housing the Archaeological Museum. Across the square is the Church of Our Lady of the Castle, the Orthodox Cathedral of Rhodes in Byzantine times, now hosting the Byzantine Museum. Nearby you can find squares with outdoor cafés and restaurants. Sokratous street is always buzzing with life thanks to its cafés and shops. 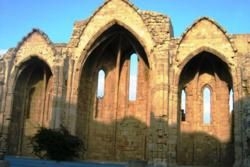 In 1988 the Medieval City of Rhodes was listed as a UNESCO World Heritage site. If you reach Saint John’s gate, you will discover a ‘quiet’ city neighbourhood, with small courtyards full of flowers and smells of homemade cooking to pour and fill you with nostalgia. that resembles the Doge's Palace in Venice, constructed by the Italian architect Florestano di Fausto. You have to see the Evangelismos Church, the Town Hall and the National Theatre. A stroll around Mandraki, the small marina with the Rhodian deer statues at its entrance and the surrounding windmills, is an experience not to be missed. Enjoy the sun and the sea at cosmopolitan Elli beach at the northern tip of Rhodes town, which is lined with modern hotels. Here you will also find the beautifully renovated historic Grande Albergo delle Rose, which today operates as a Casino. A visit to the Aquarium, one of the most important marine research centres in Greece, is a must. Don’t forget to come back in spring to attend one of the most famous medieval festivals in Greece, the ’Sound and Light Festival’, a visual extravaganza that you cannot afford to miss. 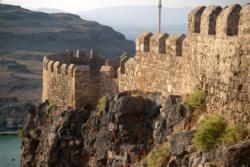 Rhodes, the capital of the Dodecanese, is an ideal island not only for those who want to relax but also for those looking for an action-packed holiday. With its bright green hills, rich green valleys and uninterrupted line of golden beaches, it is truly a blessed place. Add in the excellent facilities for tourism, the island’s special blend of cosmopolitan and traditional and numerous cultural and archaeological sites and you’ve got the perfect holiday destination. 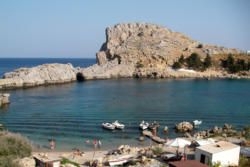 Heading down to the east coast, you firstly make a stop in Kallithea, a cosmopolitan holiday resort bustling with hotels lining Faliraki beach. In Kallithea the main attraction is the Roman baths – a unique example of Art Deco from 1929 – and the long sandy beach of Faliraki. The picturesque small bay at Ladiko (where the film "The Guns of Navarone" was shot) is a nearby beach where you can bask. At the Kallithea bay you will also find a scuba diving school and all the equipment you might need. In the verdant area of Afandou you can either bask on beautiful sandy beaches or play on a modern 18-hole golf course that is open all year round, attracting golf enthusiasts from all over the world. The road from the beautiful seaside resort of Kolimbia leads to Archipoli, a picturesque rural village. The route is ideal for walking or cycling. The road will take you through Archangelos a picturesque small village almost untouched by the rapid growth in tourism elsewhere on the island. The locals live a more simple life style, and still reverentially maintain their age-old traditions, customs, their local dialect and even the distinctive decoration of their houses. The area is famous for its golden beaches, such as Tsambika Beach at the foot of a steep cliff, and Haraki, an idyllic small bay. At the northern edge of the region is "Epta Piges" (Seven Springs), a green valley with clear flowing springs and covered with enormous plane and pine trees. The ancient city-state of Lindos (one of the three major towns of ancient Rhodes) is next, with the remains of its old acropolis, a natural watchtower facing the open sea of Aegean. At the foot lies the traditional village of Lindos with its cubic whitewashed houses, mansions, Byzantine churches and narrow cobbled streets. At the main square you can hire a donkey to take you up to the ancient acropolis, or the Byzantine chapel of Agios Ioannis and the Saint John’s castle of Knights. Of course, at Saint Paul’s Bay you can either relax in the azure sea or have a go at your favourite water sport. 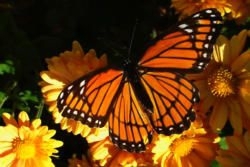 In the surrounding area you have to visit the famous "Valley of Petaloudes" (meaning Butterflies). Is the most fascinating and popular attraction of the region, a habitat of unique value for the reproduction of the Panaxia Quadripunctaria butterfly. Admire an atmosphere of incomparable beauty, with lush vegetation and streams as you stroll along cleverly laid paths. Also well worth visiting is the Museum of Natural History. The area hosts a major festival of the Virgin Mary on 15th August, while the beach of Kremasti is perfect if you like kite and windsurfing. On the western side of the island, you should go to Ialissos, a popular cosmopolitan beach resort (a favourite destination for windsurfing, kite surfers and sailing enthusiasts) and Kamiros, or the surrounding villages, such as Fanes (also in favour of kite and windsurfers), or head on the mountain slopes of Profitis Ilias. In southern Rhodes nature is unveiled in all its splendour: sun-drenched bays stretch from Kiotari and Genadi to Lahania, Plimiri and Prassonisi, the southernmost tip of the island and a popular location for windsurfing and kite surfing. The villages of the area were built in medieval times, and still maintain their traditional colour. Follow old paths and discover the beauty of golden fields and shady woods that will rejuvenate your body and soul. Kastellorizo, the easternmost island in Greece, with a long and stormy history. 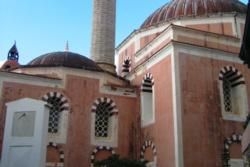 Halki, a former sponge-diving centre, is famous for its Theological School, which unfortunately does not operate anymore. Symi, a beautiful island just an hour away from Mandraki, that attracts many visitors thanks to its beautifully preserved neo-classical buildings and the famous Archangel Michael monastery at Panormitis. By aeroplane, daily from the airports of Athens and Thessaloniki.